McLaren have announced that Carlos Sainz Jr will join the team from 2019 as a replacement for Fernando Alonso. 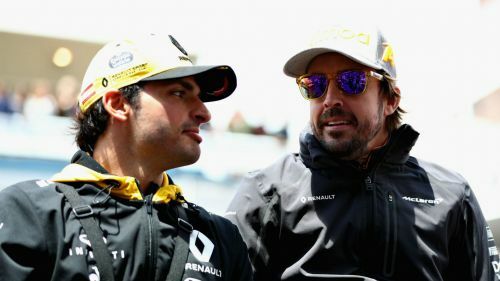 Carlos Sainz has signed a multi-year deal, after two-time world champion Alonso confirmed on Tuesday he would be departing Formula One come the end of the current campaign. Driving for Renault on loan from Red Bull, Sainz has 30 points to his name in 2018, with a best finish of fifth at the Azerbaijan Grand Prix. McLaren also said on Thursday their full driver line-up for next season will be revealed "in due course", with incumbent Stoffel Vandoorne, Force India's Esteban Ocon and Formula Two driver Lando Norris linked with the seat. "I'm delighted to finally be able to confirm that I'll be a McLaren driver from the 2019 season. It's something I've been looking at for a while and I'm very excited about this next chapter in my career," said Sainz in a release on McLaren's official website. "I've been a McLaren fan for as long as I can remember. It's a great name in the sport with an incredible heritage, and the list of drivers that have raced for McLaren over the years are among the heroes of Formula One. "Fernando is of course one of them, so it's particularly special that I'll be taking his seat as part of the next generation of Spanish racing drivers behind the wheel of a McLaren. "Finally, I'd like to thank everyone at McLaren for giving me this opportunity to fulfil a childhood dream. The team has a long-term plan for the future and I'm very much looking forward to playing a key role in its journey back to success." McLaren Racing CEO Zak Brown said: "We're incredibly excited to have Carlos join us as a McLaren driver. We've been assessing him for some time now and rate him very highly among the next generation of young talent emerging through the ranks in Formula One. "Carlos brings with him the perfect blend of youth and experience. Although he's just 23, he'll be starting his fifth season in the sport with us and will bring with him a huge amount of racing experience, both in Formula One and with our partner Renault. "It's no secret that Carlos is a huge admirer of Fernando's, and it's fitting that he will be stepping into his seat as a Spaniard with a legendary name in motorsport. We think he'll be a great fit for McLaren and we're really excited to have him join us from next season and beyond." Will McLaren ever return to winning ways?